Pretty little stackable, sterling ring with tiny hand-made glass charm in your school or team colors and tiny sterling 'Cheer' medallion. Nicely complements your School Joolz necklace, earrings or bracelet. Perfect for birthdays, championships, holiday gift-giving, or 'just because'! Choose: your primary and secondary colors for your school/team (if you don't know, click the CONTACT US tab and ask. We will research for you). 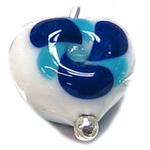 Choose: the glass charm design you like the best. It will be made in your colors. Expandable sterling ring is easy to put on as it expands to go over knuckles. 3 sizes available. The sterling cheer medallion has a megaphone and 'cheer' hand-stamped on it. 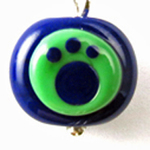 The medallion is hand stamped, and the glass charm is individually made by hand at School Joolz studios in Amesbury, MA. Shipped in a nice gift box with gift bag/tissue for easy gift-giving.